I’m a big believer in starting off the new year with a meal of black-eyed peas and greens. It’s one of the few holiday food traditions that is actually healthy and vegan, if you do it right. The legend behind this Southern tradition is that a meal of peas and greens will bring prosperity and luck in the coming year, but I like to think of it as a great way to get off on a good foot nutritionally, with basic, whole foods replacing the excesses of the holiday season. And besides, in the chill of January, few things are as comforting as a hot bowl of black-eyed peas. 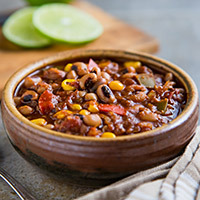 This year, I decided to shake off the January chill with a bowl of black-eyed pea chili, and I added quinoa and corn to make it extra thick and hearty. 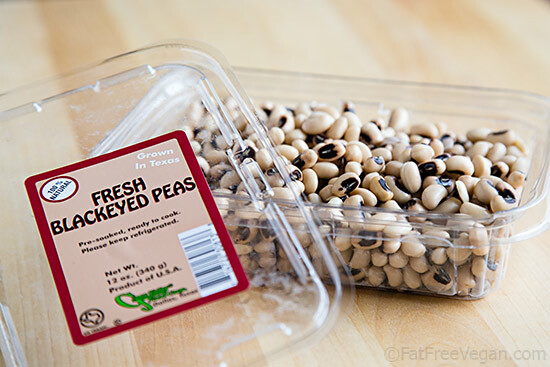 Instead of using dried beans as I usually do, I used two packages of these “fresh” black-eyed peas my husband picked up at the grocery store. I say “fresh” in quotation marks because I believe these are really just dried peas that have been pre-soaked; I’ve seen fresh black-eyed peas, and they are green rather than tan. Anyway, they cook just like soaked, dried black-eyed peas, so I’ve included the measurements for both dried and fresh below. This chili was a big success. Even my daughter E, who doesn’t like black-eyed peas since she grew into a picky teenager, liked the chili. 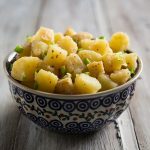 Something about the chili powder and other seasonings balances out the normally strong flavor of the peas (I call it earthy), so I think this would be a great dish to serve to someone who isn’t a big fan of the pea. This recipe makes a lot, but it can be easily halved to make a smaller pot of chili. Heat a large, non-stick Dutch oven or chili pot. [For the Instant Pot, press the Sauté button.] Add the onions and cook, stirring, until they soften, about 5 minutes. Add the bell peppers and cook for another 3 minutes. Add the garlic and cook for another minute. Add salt and pepper to taste. 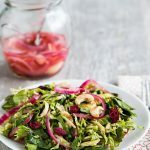 Serve with a squeeze of lime juice or slices of avocado, if desired. This recipe should work well in the slow cooker. In step 2, cook on high for 4-5 hours, low for 8-10. Add the quinoa and corn during the last hour of cooking. This post contains an Amazon affiliate link to a product I actually use, Muir Glen Organic Fire-Roasted Tomatoes, yum! These tomatoes give chili and other dishes a great flavor, and Amazon’s price for a case with Prime shipping makes them less expensive than what I would pay locally. When you buy something through my Amazon links, I receive a commission that helps support this site. Thanks for your purchase! Holy cow! My husband just made this recipe and it’s amazing! 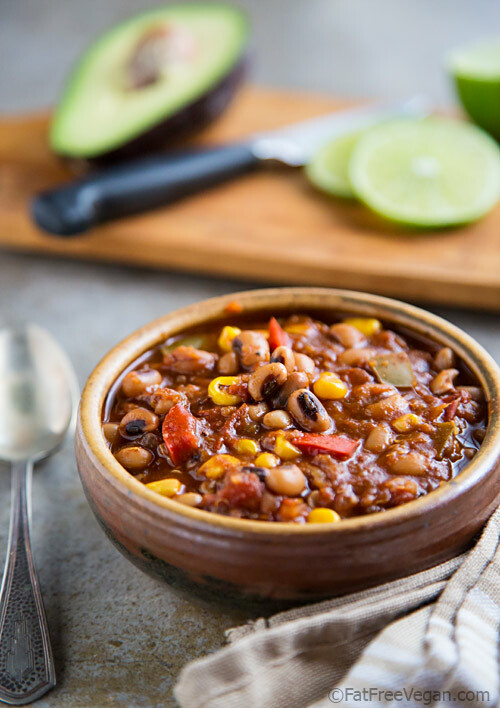 I love black eyed peas but have never had them in a chili before. I love the earthiness they add to the meal and they go so well with the sweetness of the corn. 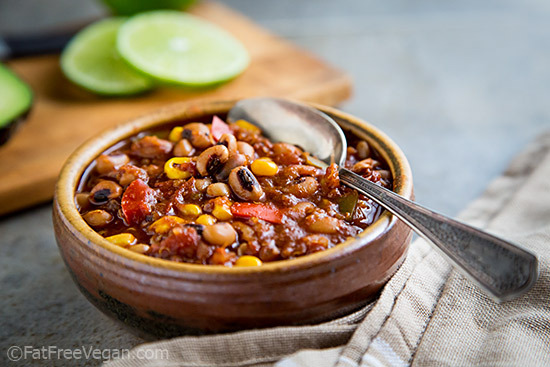 Thanks for an awesome vegan chili recipe! This was just stellar! I’ve never been a fan of BEP because in my youth, I think my mom used canned or something because I always didn’t like whatever BEP dish was served up on New Year’s. We decided to try them one more time, for posterity’s sake, and having recently turned veg/vege, we tried this recipe I stumbled on. It is great! We feel the beans, after soaking overnight and cooking first 8 hours in the crock, then another 2 hours the next day, never really got DONE, but I’m unfamiliar with BEP and maybe they stay a little tooth resistant. They weren’t tough, just not mushy. We didn’t have any veg broth, our veg chicken broth having gone south in the refrigerator, so I used a contained of mushroom broth; and I added Aleppo chili powder having been out of cayenne powder (aleppo are kind of a taste mix of cumin and chili). Anyway, this dish was excellent and we ate it two days in a row and probably will have it again tonight. Maybe I’ll add a couple more hours of crockpot heat to it, too! This looks tasty. I’m making it right now. I’m sure my family will love it. Thank you Susan! 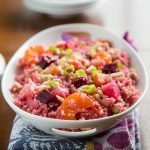 I just discovered this recipe, made it this morning and am having my first bowl for lunch. It is DELICIOUS! I did not have regular smoked paprika, just plain and hot smoked paprika. So I added a tsp of liquid smoke to compensate. The flavor is just a perfect blend to make a party in your mouth! Thank you for sharing this, and for all the work you do!. This is a keeper-like everything else you do that I have made. Delicious! Used two cans of mild Rotel tomatoes with chilies and it turned out great. The chili didn’t need any additional salt, plenty of flavor going on for the vegetarians in my group. I just got an Instant Pot for Christmas….YAY!!! 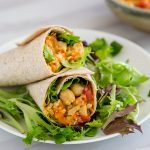 Both my daughters and I have gone vegan & this recipe looks amazing!! I love Black Eyed Pea (& I’m not even from the South!!) and all the other ingredients sound awesome!! Going to make it New Years Eve & serve it New Years Day for a better year ahead!! This was my second time using this recipe. I have now named it my New Years Good Luck chili because this is how I eat my black eyed peas for the New Years. Thank you for helping me create a new tradition. This chili is so wonderful.